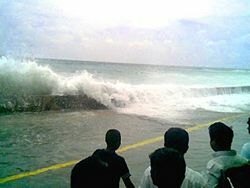 The tsunami that struck Malé in the Maldives on December 26, 2004. A tsunami (IPA: /(t)sʊˈnɑːmi/) is a series of waves created when a body of water, such as an ocean, is rapidly displaced. Earthquakes, mass movements above or below water, volcanic eruptions and other underwater explosions, landslides, large meteorite impacts, and nuclear weapons testing at sea all have the potential to generate a tsunami. A tsunami can have a range of effects, from unnoticeable to devastating. A tsunami has a much smaller amplitude (wave height) offshore, and a very long wavelength (often hundreds of kilometers long). Consequently, they generally pass unnoticed at sea, forming only a passing "hump" in the ocean. Submarine earthquakes dislocate the oceanic crust, pushing water upwards. Tsunami have been historically referred to as tidal waves because, as they approach land, they take on the characteristics of a violent, onrushing tide, rather than the sort of cresting waves formed by wind action on the ocean. Given that they are not actually related to tides, the term is considered misleading and its usage is discouraged by oceanographers. The term tsunami comes from the Japanese words (津波、つなみ) meaning harbor ("tsu," 津) and wave ("nami," 波). [a. Jap. tsunami, tunami, f. tsu harbor + nami waves. - Oxford English Dictionary]. For the plural, one can either follow ordinary English practice and add an s, or use an invariable plural as in Japanese. The term was created by fishermen who returned to port to find the area surrounding their harbor devastated, although they had not been aware of any wave in the open water. Tsunami are common throughout Japanese history; approximately 195 events in Japan have been recorded. A tsunami can be generated when the plate boundaries abruptly deform and vertically displace the overlying water. Such large vertical movements of the Earth’s crust can occur at plate boundaries. Subduction earthquakes are particularly effective in generating tsunami. Also, one tsunami in the 1940s in Hilo, Hawaii, was actually caused by an earthquake on one of the Aleutian Islands in Alaska. That earthquake was 7.8 on the Richter Scale. Tsunami are formed as the displaced water mass moves under the influence of gravity and radiates across the ocean like ripples on a pond. In the 1950s, it was discovered that larger tsunami than previously believed possible could be caused by landslides, explosive volcanic action, and impact events when they contact water. These phenomena rapidly displace large volumes of water, as energy from falling debris or expansion is transferred to the water into which the debris falls. 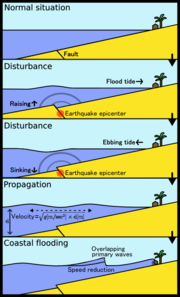 Tsunami caused by these mechanisms, unlike the ocean-wide tsunami caused by some earthquakes, generally dissipate quickly and rarely affect coastlines distant from the source due to the small area of sea affected. These events can give rise to much larger local shock waves (solitons), such as the landslide at the head of Lituya Bay which produced a water wave estimated at 50 – 150 m and reached 524 m up local mountains. However, an extremely large landslide could generate a “megatsunami” that might have ocean-wide impacts. When the first part of a tsunami to reach land is a trough rather than a crest of the wave, the water along the shoreline may recede dramatically, exposing areas that are normally always submerged. This can serve as an advance warning of the approaching crest of the tsunami, although the warning arrives only a very short time before the crest, which typically arrives seconds to minutes later. In the 2004 tsunami that occurred in the Indian Ocean, the sea receding was not reported on the African coast or any other western coasts it hit, when the tsunami approached from the east. Tsunami occur most frequently in the Pacific Ocean, but are a global phenomenon; they are possible wherever large bodies of water are found, including inland lakes, where they can be caused by landslides. Very small tsunami, non-destructive and undetectable without specialized equipment, occur frequently as a result of minor earthquakes and other events. A tsunami can also be known to come when the water leaves an ocean or large body of water, and then the water in it causes a large series of waves to approach land. Tsunami cannot be prevented or precisely predicted, but there are some warning signs of an impending tsunami, and there are many systems being developed and in use to reduce the damage from tsunami. In instances where the leading edge of the tsunami wave is its trough, the sea will recede from the coast half of the wave's period before the wave's arrival. If the slope is shallow, this recession can exceed many hundreds of meters. People unaware of the danger may remain at the shore due to curiosity, or for collecting shellfish from the exposed seabed. Regions with a high risk of tsunami may use tsunami warning systems to detect tsunami and warn the general population before the wave reaches land. In some communities on the west coast of the United States, which is prone to Pacific Ocean tsunami, warning signs advise people where to run in the event of an incoming tsunami. Computer models can roughly predict tsunami arrival and impact based on information about the event that triggered it and the shape of the seafloor (bathymetry) and coastal land (topography). One of the early warnings comes from nearby animals. Many animals sense danger and flee to higher ground before the water arrives. The Lisbon quake is the first documented case of such a phenomenon in Europe. The phenomenon was also noted in Sri Lanka in the 2004 Indian Ocean earthquake. Some scientists speculate that animals may have an ability to sense subsonic Rayleigh waves from an earthquake minutes or hours before a tsunami strikes shore). More likely, though, is that the certain large animals (e.g., elephants) heard the sounds of the tsunami as it approached the coast. The elephants' reactions were to go in the direction opposite of the noise, and thus go inland. Humans, on the other hand, head down to the shore to investigate. While it is not possible to prevent tsunami, in some particularly tsunami-prone countries some measures have been taken to reduce the damage caused on shore. Japan has implemented an extensive programme of building tsunami walls of up to 4.5 m (13.5 ft) high in front of populated coastal areas. Other localities have built floodgates and channels to redirect the water from incoming tsunami. However, their effectiveness has been questioned, as tsunami are often higher than the barriers. For instance, the tsunami which struck the island of Hokkaidō on July 12, 1993 created waves as much as 30 m (100 ft) tall - as high as a ten-story building. The port town of Aonae was completely surrounded by a tsunami wall, but the waves washed right over the wall and destroyed all the wood-framed structures in the area. The wall may have succeeded in slowing down and moderating the height of the tsunami, but it did not prevent major destruction and loss of life. The effects of a tsunami can be mitigated by natural factors such as tree cover on the shoreline. Some locations in the path of the 2004 Indian Ocean tsunami escaped almost unscathed as a result of the tsunami’s energy being sapped by a belt of trees such as coconut palms and mangroves. In one striking example, the village of Naluvedapathy in India's Tamil Nadu region suffered minimal damage and few deaths as the wave broke up on a forest of 80,244 trees planted along the shoreline in 2002 in a bid to enter the Guinness Book of Records. Environmentalists have suggested tree planting along stretches of seacoast which are prone to tsunami risks. While it would take some years for the trees to grow to a useful size, such plantations could offer a much cheaper and longer-lasting means of tsunami mitigation than the costly and environmentally destructive method of erecting artificial barriers. Japan is the nation with the most recorded tsunami in the world. The earliest recorded disaster was the tsunami associated with the 684 C.E. Hakuho Earthquake. The number of tsunami in Japan totals 195 over a 1,313 year period, averaging one event every 6.7 years, the highest rate of occurrence in the world. These waves have hit with such violent fury that entire towns have been destroyed. The destruction of much of Alexandria on August 21, 365 C.E. is presently attributed to a tsunami. In the witness account collected soon afterward by Ammianus Marcellinus (in his "Roman history," book 26) all the typical features of a tsunami can be recognized: “The sea was driven back, and its waters flowed away to such an extent that the deep sea bed was laid bare, and many kinds of sea creatures could be seen. (…) Many ships were therefore stranded as if on dry land, and many people wandered freely (…) gathering fish and similar creatures (…) huge masses of water flowed back when least expected, and now overwhelmed and killed many thousands of people (…) Some great ships were hurled by the fury of the waves on to roof tops (as happened at Alexandria) and others were thrown up to two miles from the shore”. In 1607, Bristol Channel floods resulted in the drowning of an estimated 2000 or more people, with houses and villages swept away, farmland inundated and livestock destroyed, wrecking the local economy along the coasts of the Bristol Channel, UK. Some churches have plaques up to 8ft above sea level to show how high the waters rose. The cause of the flood is not yet proven, but a research paper published in the journal Archaeology in the Severn Estuary in 2002 following investigations by Professor Simon Haslett, from Bath Spa University, and Australian geologist Ted Bryant, from the University of Wollongong, proposed that the flooding was caused by a tsunami. The British Geological Survey has suggested an earthquake on a known unstable fault off the coast of Ireland causing the vertical displacement of the sea floor as the possible cause. The first recorded tsunami ever was in Japan on October 14, 684. It occurred off the shore of the Kii Peninsula. It has been estimated to be a magnitude 8.3. It was followed by a huge tsunami, but no estimates on how many deaths. Suruga Bay and Izu Peninsula experienced great tsunamis in 1096, followed by Shikoku and Kii Peninsula great tsunami of 1099. The magnitudes of both are estimated to have been in the 8 range. January 26, 1700 - The Cascadia Earthquake, one of the largest earthquakes on record (estimated MW 9 magnitude), ruptured the Cascadia subduction zone (CSZ) offshore from Vancouver Island to northern California, and caused massive tsunami across the Pacific Northwest logged in Japan and oral traditions of the Native Americans. Brian F. Atwater, Musumi-Rokkaku Satoko, Satake Kenji, Tsuji Yoshinobu, Ueda Kazue, and David K. Yamaguch prepared a "scientific detective story" investigating this tsunami entitled The Orphan Tsunami of 1700—Japanese Clues to a Parent Earthquake in North America. In Nov 23, 1703, an offshore earthquake produced a massive tsunami, hitting the southern shores of Kanagawa prefecture. Mount Fuji erupted, spewing heavy ash over Edo (now Tokyo). It was estimated to be magnitude 8.1, and 5,200 people died from the combined quake and tsunami, later more died from the ashfall crushing roofs. Tens of thousands of Portuguese who survived the Great Lisbon Earthquake on November 1 were killed by a tsunami which followed a half hour later. Many townspeople fled to the waterfront, believing the area safe from fires and from falling debris from aftershocks. Before the great wall of water hit the harbor, waters retreated, revealing lost cargo and forgotten shipwrecks. These people did not know that a Tsunami is a succession of waves, rather than just a single one. The earthquake, tsunami, and many forest fires killed between 60,000 and 100,000 of Lisbon's pre-quake population of 275,000. Historical records of explorations by Vasco da Gama and other early navigators were lost, and countless buildings were destroyed (including most examples of Portugal's Manueline architecture). Europeans of the eighteenth century struggled to understand the disaster within religious and rational belief systems. Philosophers of the Enlightenment, notably Voltaire, wrote about the event. The philosophical concept of the sublime, as described by philosopher Immanuel Kant in the Observations on the Feeling of the Beautiful and Sublime, took inspiration in part from attempts to comprehend the enormity of the Lisbon quake and tsunami. The tsunami took just over four hours to travel over 1000 miles to Cornwall in the United Kingdom. An account by Arnold Boscowitz (a century later) claimed "great loss of life." An undersea earthquake of estimated magnitude 7.4 occurred near Yaeyama Islands in Okinawa, Japan on April 4, 1771 at about 8 A.M. The earthquake is not believed to have directly resulted in any deaths, but a resulting tsunami is thought to have killed about 12,000 people, (9313 on the Yaeyama Islands and 2548 on Miyako Islands according to one source. Estimates of the highest seawater runup on Ishigaki Island, range between 30 meters and 85.4 meters. The tsunami put an abrupt stop to population growth on the islands, and was followed by malaria epidemics and crop failures which decreased the population further. It was to be another 148 years before population returned to its pre-tsunami level. Tsunamis were the main cause of death for Japan's worst-ever volcanic disaster, due to an eruption of Mount Unzen in Nagasaki Prefecture, Kyūshū, Japan. It began towards the end of 1791 as a series of earthquakes on the western flank of Mount Unzen which gradually moved towards Fugen-daké, one of Mount Unzen's peaks. In February 1792, Fugen-daké started to erupt, triggering a lava flow which continued for two months. Meanwhile, the earthquakes continued, shifting nearer to the city of Shimabara. On the night of May 21, two large earthquakes were followed by a collapse of the eastern flank of Mount Unzen's Mayuyama dome, causing an avalanche which swept through Shimabara and into Ariake Bay, triggering a tsunami. It is not known to this day whether the collapse occurred as a result of an eruption of the dome or as a result of the earthquakes. The tsunami struck Higo Province on the other side of Ariake Bay before bouncing back and hitting Shimabara again. Out of an estimated total of 15,000 fatalities, around 5,000 is thought to have been killed by the landslide, around 5000 by the tsunami across the bay in Higo Province, and a further 5000 by the tsunami returning to strike Shimabara. The Great Ansei Nankai quake, was actually set of three quakes, two magnitude 8.4 quakes and a 7.4 quake all in three days. The first on Nov. 4, 1854 near what is today Aichi Prefecture and Shizuoka Prefecture with tsunami, followed by another 8.4 the next day in Wakayama Prefecture, which created a 10-meter high tsunami that hit the south coast of Japan. The third was a 7.4 quake on Nov. 7, 1854 in Ehime Prefecture and Oita Prefecture. The result was 80,000-100,000 deaths. The following year, the 1854 Edo Ansei Quake hit (Tokyo region), killing 4,500 to 10,000 people. Popular stories of the time blamed the quakes and tsunamis on giant catfish thrashing about. On April 2, 1868, a local earthquake with a magnitude estimated between 7.25 and 7.75 rocked the southeast coast of the Big Island of Hawai’i. It triggered a landslide on the slopes of the Mauna Loa volcano, five miles north of Pahala, killing 31 people. A tsunami then claimed 46 additional lives. The villages of Punaluu, Ninole, Kawaa, Honuapo, and Keauhou Landing were severely damaged. According to one account, the tsunami "rolled in over the tops of the coconut trees, probably 60 feet high …. inland a distance of a quarter of a mile in some places, taking out to sea when it returned, houses, men, women, and almost everything movable." This was reported in the 1988 edition of Walter C. Dudley's book Tsunami! (ISBN 0824811259). The island volcano of Krakatoa in Indonesia exploded with devastating fury on August 26-27, 1883, blowing its underground magma chamber partly empty so that much overlying land and seabed collapsed into it. A series of large tsunami waves was generated from the collapse, some reaching a height of over 40 meters above sea level. Tsunami waves were observed throughout the Indian Ocean, the Pacific Ocean, the American West Coast, South America, and even as far away as the English Channel. On the facing coasts of Java and Sumatra the sea flood went many miles inland and caused such vast loss of life that one area was never resettled but went back to the jungle and is now the Ujung Kulon nature reserve. The aftermath of the tsunami that struck Newfoundland in 1929. On 15 June, 1896, at around 19:32 local time, a magnitude 8.5 undersea earthquake off the Sanriku coast of northeastern Honshū, Japan, triggered tsunami waves which struck the coast about half an hour later. Although the earthquake itself is not thought to have resulted in any fatalities, the waves, the highest recorded measurement of which reaching 38.2 meters, killed approximately 20,000 people. In 2005 the same general area was hit by the 2005 Sanriku Japan Earthquake, but with no tsunami. The Halifax Explosion occurred on Thursday, December 6, 1917 at 9:04:35 A.M. local time in Halifax, Nova Scotia in Canada, when the French munitions ship Mont-Blanc, bound for World War I France, collided with the Norwegian ship Imo, chartered to carry Belgian relief supplies. In the aftermath of the collision, Mont-Blanc caught fire and exploded. The explosion caused a tsunami, and a pressure wave of air. The Great Kanto Earthquake, which occurred in Eastern Japan on September 1, 1923, and devastated Tokyo, Yokohama and the surrounding areas, caused tsunami which struck the Shonan coast, Boso Peninsula, Izu Islands and the east coast of Izu Peninsula, within minutes in some cases. In Atami, waves reaching 12 meters were recorded. Examples of tsunami damage include about 100 people killed along Yui-ga-hama beach in Kamakura and an estimated 50 people on the Enoshima causeway. However, tsunami only accounted for a small proportion of the final death toll of over 100,000, most of whom were killed in fire. On November 18, 1929, an earthquake of magnitude 7.2 occurred beneath the Laurentian Slope on the Grand Banks. The quake was felt throughout the Atlantic Provinces of Canada and as far west as Ottawa and as far south as Claymont, Delaware. The resulting tsunami measured over 7 meters in height and took about 2½ hours to reach the Burin Peninsula on the south coast of Newfoundland, where 29 people lost their lives in various communities. It also snapped telegraph lines laid under the Atlantic. On March 3, 1933, the Sanriku coast of northeastern Honshū, Japan which had already suffered a devastating tsunami in 1896 (see above) was again stuck by tsunami waves as a result of an offshore magnitude 8.1 earthquake. The quake destroyed about 5,000 homes and killed 3,068 people, the vast majority as a result of tsunami waves. Especially hard hit was the coastal village of Taro (now part of Miyako city) in Iwate Prefecture, which lost 42 percent of its total population and 98% of its buildings. 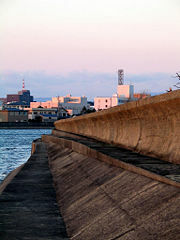 Taro is now protected by an enormous tsunami wall, currently 10 meters in height and over 2 kilometers long. The original wall, constructed in 1958, saved Taro from yet another destruction from the 1960 Chilean tsunami (see below). A magnitude 8.0 earthquake on 7 December, 1944, about 20 km off the Shima Peninsula in Japan, which struck the Pacific coast of central Japan, mainly Mie, Aichi, and Shizuoka Prefectures. 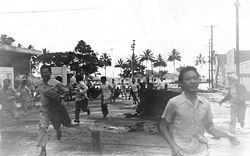 News of the event was downplayed by the authorities in order to protect wartime morale, and as a result the full extent of the damage is not known, but the quake is estimated to have killed 1223 people, the tsunami being the leading cause of the fatalities. The Nankai earthquake, a periodic earthquake of around magnitude 8.0 which occurs off the southern coast of Kii Peninsula and Shikoku, Japan every 100 to 150 years, last struck on 21 December, 1946. The resulting tsunami hit the Pacific coast of western Japan. Particularly hard hit were the coastal towns of Kushimoto and Kainan on the Kii Peninsula. The quake led to more than 1400 deaths, tsunami being the leading cause . The April 1 Aleutian Island earthquake tsunami that killed 159 people on Hawai’i and five in Alaska (the lighthouse keepers at the Scotch Cap Light in the Aleutians) resulted in the creation of a tsunami warning system known as the Pacific Tsunami Warning System (specifically the PTWC), established in 1949 for Pacific Ocean area countries. The tsunami is known as the April Fools Day Tsunami in Hawai’i due to people thinking the warnings were an April Fools prank. On July 9, 1958, an earthquake with a magnitude of 8.3 on the Richter scale rocked a small inlet in Alaska called Lituya Bay. It then caused part of a mountain at the back of the bay to collapse, causing a monstrous tsunami (an iminami) to fly headlong through the bay. At a mountain at the mouth of the bay, the run was measured to be 524 m (about 1742 ft) making it the largest wave in recorded history. It swept up three boats; one managed to ride the wave, but the other two were swept into the Pacific Ocean, where they were completely destroyed and four people aboard them were killed. The magnitude 9.5 Great Chilean Earthquake of May 22, 1960 is the strongest earthquake ever recorded. Its epicenter, off the coast of South Central Chile, generated one of the most destructive tsunami of the 20th Century. It spread across the entire Pacific Ocean, with waves measuring up to 25 meters high. The first tsunami arrived at Hilo approximately 14.8 hrs after it originated off the coast of South Central Chile. The highest wave at Hilo Bay was measured at around 10.7 m (35 ft). 61 lives were lost allegedly due to people's failure to heed warning sirens. The Vajont Dam as seen from Longarone today, showing approximately the top 60-70 metres of concrete. The 200-250 metre wall of water (megatsunami) that over-topped the dam would have obscured virtually all of the sky in this picture. 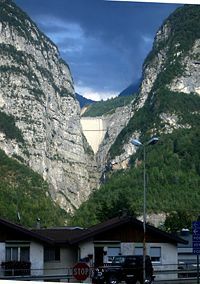 The Vajont Dam was completed in 1961 under Monte Toc, 100 km north of Venice, Italy. At 262 metres, it was one of the highest dams in the world. On October 9, 1963 an enormous landslide of about 260 million cubic metres of forest, earth, and rock, fell into the reservoir at up to 110 km per hour (68 mph). The resulting displacement of water caused 50 million cubic metres of water to overtop the dam in a 250-metre high wave. The flooding destroyed the villages of Longarone, Pirago, Rivalta, Villanova and Faè, killing 1,450 people. Almost 2,000 people (some sources report 1,909) perished in total. The 1964 Niigata earthquake in Japan killed 28 people, and liquefacted whole apartment buildings. A subsequent tsunami destroyed the port of Niigata city. On August 16, 1976 at 12:11 A.M., a devastating earthquake of 7.9 hit the island of Mindanao, Philippines. It created a tsunami that devastated more than 700 km of coastline bordering Moro Gulf in the North Celebes Sea. An estimated number of victims for this tragedy left 5,000 dead, 2,200 missing or presumed dead, more than 9,500 injured and a total of 93,500 people were left homeless. It devastated the cities of Cotabato, Pagadian, and Zamboanga, and the and provinces of Basilan, Lanao del Norte, Lanao del Sur, Maguindanao, Sultan Kudarat, Sulu, and Zamboanga del Sur. A magnitude 7.9 earthquake occurred on December 12, 1979 at 7:59:4.3 UTC along the Pacific coast of Colombia and Ecuador. The earthquake and the resulting tsunami caused the destruction of at least six fishing villages and the death of hundreds of people in the Colombian province of Nariño. The earthquake was felt in Bogotá, Cali, Popayán, Buenaventura, and several other cities and towns in Colombia and in Guayaquil, Esmeraldas, Quito, and other parts of Ecuador. When the Tumaco Tsunami hit the coast, it caused huge destruction in the city of Tumaco, as well as in the small towns of El Charco, San Juan, Mosquera, and Salahonda on the Pacific coast of Colombia. The total number of victims of this tragedy was 259 dead, 798 wounded and 95 missing or presumed dead. A devastating tsunami wave occurred along the coasts of Hokkaidō in Japan as a result of a magnitude 7.8 earthquake, 80 miles offshore, on July 12, 1993. Within minutes, the Japan Meteorological Agency issued a tsunami warning that was broadcast on NHK in English and Japanese. However, it was too late for Okushiri, a small island near the epicenter, which was struck with extremely big waves, some reaching 30 meters, within two to five minutes of the quake. Aonae, a village on a low-lying peninsula at the southern tip of the island, was devastated over the course of the following hour by 13 waves of over two meters’ height arriving from multiple directions, including waves that had bounced back off Hokkaidō—despite being surrounded by tsunami barriers. Of 250 people killed as a result of the quake, 197 were victims of the series of tsunamis that hit Okushiri; the waves also caused deaths on the coast of Hokkaidō. While many residents, remembering the 1983 tsunami (see above), survived by quickly evacuating on foot to higher ground, it is thought that many others underestimated how soon the waves would arrive (the 1983 tsunami took 17 minutes to hit Okushiri) and were killed as they attempted to evacuate by car along the village’s narrow lanes. The highest wave of the tsunami was a staggering 31 meters (102 feet) high. On July 17, 1998, a Papua New Guinea tsunami killed approximately 2200 people . A 7.1 magnitude earthquake 24 km offshore was followed within 11 minutes by a tsunami about 12 m tall. While the magnitude of the quake was not large enough to create these waves directly, it is believed the earthquake generated an undersea landslide, which in turn caused the tsunami. The villages of Arop and Warapu were destroyed. 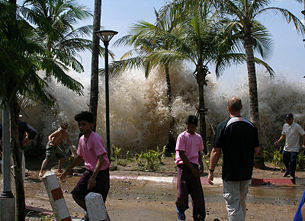 The 2004 Indian Ocean earthquake; Tsunami strikes Ao Nang, Thailand. The 2004 Indian Ocean earthquake, which had a magnitude of 9.0 to 9.3, triggered a series of lethal tsunami on December 26, 2004, that killed approximately 300,000 people (including 168,000 in Indonesia alone), making it the deadliest tsunami as well as one of the deadliest natural disasters in recorded history. It also had the second-largest earthquake in recorded history. The initial surge was measured at a height of approximately 33 meters (108 feet), making it the largest earthquake-generated tsunami in recorded history. The tsunami killed people over an area ranging from the immediate vicinity of the quake in Indonesia, Thailand, and the north-western coast of Malaysia, to thousands of kilometres away in Bangladesh, India, Sri Lanka, the Maldives, and even as far away as Somalia, Kenya, and Tanzania in eastern Africa. This is an example of a teletsunami which can travel vast distances across the open ocean, in this case, it is an inter-continental tsunami. Tsunami waves 2.6 meters tall were reported even in places such as Mexico, nearly 13,000 km away from the epicenter. The energies for these waves travel along fault lines and becoming concentrated therefore traveling further. Unlike in the Pacific Ocean, there was no organized alert service covering the Indian Ocean. This was in part due to the absence of major tsunami events since 1883 (the Krakatoa eruption, which killed 36,000 people). In light of the 2004 Indian Ocean tsunami, UNESCO and other world bodies have called for an international tsunami monitoring system. A 7.7 magnitude earthquake rocked the Indian Ocean seabed on July 17,2006, 200 km south of Pangandaran, a beautiful beach famous to surfers for its perfect waves. This earthquake triggered tsunami whose heights varied from 2 meters at Cilacap to 6 meters at Cimerak beach, where it swept away and flattened buildings as far as 400 meters away from the coastline. More than 800 people were reported missing or dead. On November 15, 2006, an 8.1 magnitude quake struck an area claimed by both Russia and Japan, but the waves near Japan did not swell higher than 23 inches. There were no immediate reports of casualties or damage. Six hours later, tsunami waves up to nearly 5 feet high caused by the quake crashed into Crescent City, California and Santa Cruz, California causing considerable damage. On April 2, 2007, a powerful magnitude 8.1 (initially 7.6) earthquake hit the East Pacific region about 25 miles (40 km) northwest of the Solomon Islands at 7:39 A.M., resulting in a tsunami that was up to 17 feet (5 meters) tall. The wave, which struck the coast of Solomon Islands (mainly Gizo), triggered region-wide tsunami warnings and watches extending from Japan to New Zealand to Hawaii and the eastern seaboard of Australia. So far, at least 39 people are confirmed dead with the toll expected to rise. Dozens more have been injured with entire towns inundated by the sweeping water which traveled 300 meters inland in some places. Simbo, Choiseul and Ranunga islands were also affected. A state of national emergency was declared for the Solomon Islands. On the island of Choiseul, a wall of water reported to be 30 feet high swept almost 400 meters inland destroying everything in its path. Officials estimate that the tsunami displaced more than 5000 residents all over the archipelago. On July 16, 2007, a strong earthquake struck northwestern Japan, causing a fire and minor radioactive water leak at one of the world's most powerful nuclear power plants. At least seven people were killed and hundreds injured. Japan's Meteorological Agency measured the quake at 6.8 on the richter scale and sending aftershocks of 6.6. The U.S. Geological Survey, which monitors quakes around the world, said the initial quake registered 6.7. A tsunami watch was issued along the Sea of Japan. The predicted height of the tsunami was estimated to be 50 cm (20 inches). That earthquake sparked only a few small tsunamis, growing to be no more than about 20 cm (8 inches) tall. However, the 1964 quake and tsunami north of the current one destroyed the port of the city of Niigata. 6 August 1923 - Rockaway Park, Queens, NY . 8 August 1924 - Coney Island, NY . ca. 450 B.C.E. : The Greek historian Thucydides in his book History of the Peloponnesian Wars, speculated about the causes of tsunami. He argued that it could only be explained as a consequence of ocean earthquakes, and could see no other possible causes for the phenomenon. 1541: a tsunami struck the earliest European settlement in Brazil, São Vicente. There is no record of deaths or injuries, but the town was almost completely destroyed. January 20, 1606/1607: along the coast of the Bristol Channel thousands of people were drowned, houses and villages swept away, farmland was inundated and flocks were destroyed by a flood that might have been a tsunami. While it is quite possible that it was caused by a combination of meteorological extremes and tidal peaks, recent evidence points more strongly towards a tsunami. ↑ Can It Happen Here? USGS. Retrieved August 18, 2007. ↑ The Aitape 1998 tsunami: Reconstructing the event from interviews and field mapping. NOAA. Retrieved August 18, 2007. ↑ The Tsunami Story. NOAA. Retrieved August 18, 2007. ↑ Tsunami: Anatomy of a disaster. BBC News. Retrieved August 18, 2007. ↑ Christine Kenneally, 2004, Surviving the Tsunami. Slate. Retrieved August 18, 2007. ↑ Tsunami villagers give thanks to trees. BBC News. Retrieved August 18, 2007. ↑ Jean-Daniel Stanley and Thomas F. Jorstad. 2005. The 365 C.E. tsunami destruction of Alexandria, Egypt: erosion, deformation of strata and introduction of allochthonous material. GSA. Retrieved August 18, 2007. ↑ U.S. Geological Survey Professional Paper 1707. The Orphan Tsunami of 1700—Japanese Clues to a Parent Earthquake in North America. USGS. Retrieved August 18, 2007. ↑ 安政南海地震. (Japanese). Retrieved August 18, 2007. ↑ Emergency & Disasters Data Base. CRED. Retrieved August 18, 2007. ↑ Descriptive Model of the July 17, 1998 Papua New Guinea Tsunami. USGS. Retrieved August 18, 2007. ↑ Dec 26, 2004 Magnitude 9.0 Earthquake & Tsunami in the Indian Ocean. NOAA. Retrieved August 18, 2007. ↑ Strong quake jolts Japan, tsunami alert issued. Reuters. Retrieved August 18, 2007. ↑ Mitch Marconi, 2007. Second Japan Earthquake In Sea Of Japan 6.8 Magnitude, Tsunami Fear. The Post Chronicle. Retrieved August 18, 2007. ↑  Tsunamis & Seiches. ASC India.org. Retrieved August 18, 2007. ↑ Marine Georesources & Geotechnology. Taylor & Francis Group. Retrieved August 18, 2007. ↑ TSUNAMIS ET RAZ DE MAREE HISTORIQUES. (French). Azurseisme. Retrieved August 18, 2007. ↑ Was Bristol Channel hit by a tsunami? information from Edward A. Bryant and Simon K. Haslett, "Catastrophic Wave Erosion, Bristol Channel, United Kingson: Impact of Tsunami?" The Journal of Geology 115: 253-269. Eurekalert. Retrieved August 18, 2007. Dudley, Walter C. & Min Lee. 1988. Tsunami! Honolulu, HI: University of Hawaii Press. ISBN 0824811259. Kenneally, Christine. 2004). Surviving the Tsunami. Slate.com. Retrieved August 18, 2007. Macey, Richard. 2005. "The Big Bang that Triggered A Tragedy," The Sydney Morning Herald, 11 - quoting Dr Mark Leonard, seismologist at Geoscience Australia. Lambourne, Helen. 2005. Tsunami: Anatomy of a disaster. BBC News. Retrieved August 18, 2007. Tsunamis: Tsunamis travel fast but not at infinite speed. abelard.org. Retrieved August 18, 2007. The NOAA's page on the 2004 Indian Ocean earthquake and tsunami. NOAA. Retrieved August 18, 2007. NOAA Tsunami — General description of tsunamis and the United States agency NOAA's role in Tsunami hazard assessment, preparedness, education, forecasts & warnings, response, and research. The International Centre for Geohazards (ICG). NOAA Center for Tsunami Research (incorporates the PMEL Tsunami Research Program) (United States). USGS: Surviving a tsunami (United States). Computer-generated animation of a tsunami. Animations of actual and simulated tsunami events from the NOAA Center for Tsunami Research. How do tsunamis differ from other water waves?.